(Guest) J&C Studios O Gauge Archive Balto&NY Almost qutting time! The last shift of the day is nearly over. The crew has just finished work on a pair of spare trucks for a B&O sleeper. The shop tracks look empty. But out in the yard are more cars needing work tomorrow. A "Speedliner" RDC-2 heads west from Edgewater station to Philadelphia and beyond along the Baltimore & New York Rwy. The trucks at the shop are Keil Line kits with Budd disc brake detail. 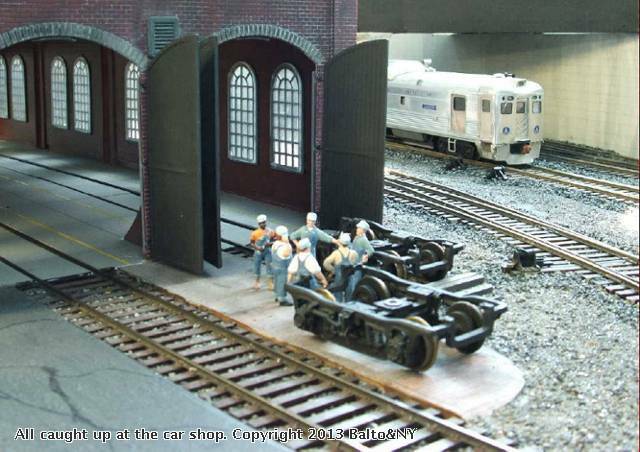 Unfortunately they were not strong enough for operation under a heavy Mac Shops B&O sleeper, so they became scenery detail. The RDC was built from a Mac Shops kit. It features full interior detail, crew, passengers, interior and directional lighting. B&O heralds and Speedliner plaques were computer drawn and printed on decal stock. The RDC-2 is powered by two NWSL "Magic Carpet" units in the front truck. It rides on All Nation RDC trucks from the 1960s that were modified to represent later General Steel Castings RDC trucks.